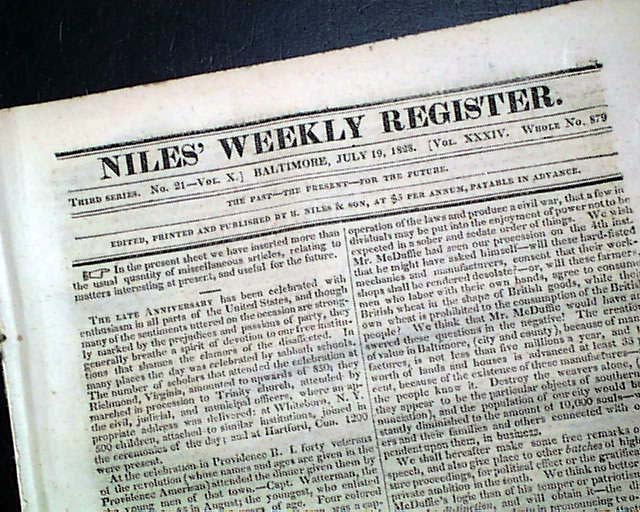 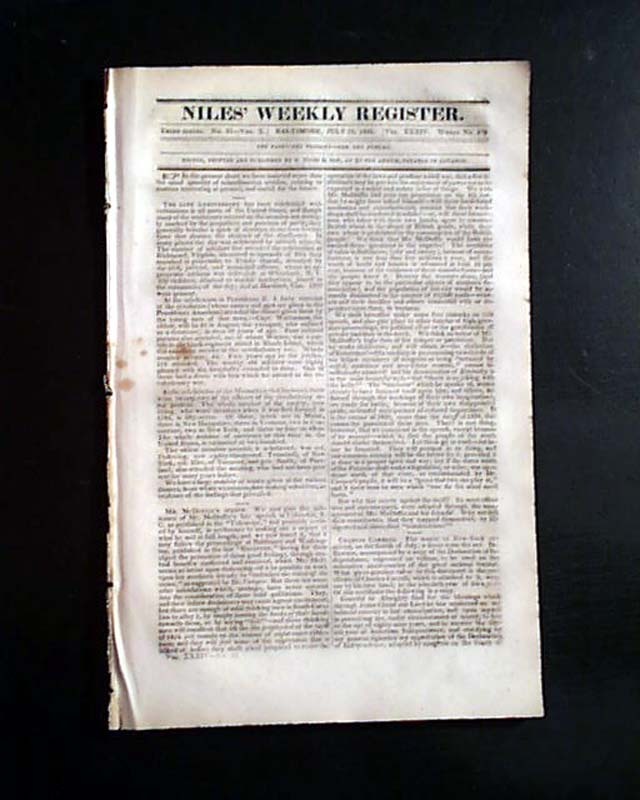 NILES' WEEKLY REGISTER, Baltimore, July 19, 1828 The front page has, "CHARLES CARROLL," which gives details of the last surviving signor of the Declaration of Independence presenting a copy of The Declaration to the mayor of New York City, along with a copy of a letter written in his own hand which states in part: "Grateful to Almighty God for the blessings which, through Jesus Christ Our Lord, He had conferred on my beloved country in her emancipation and on myself in permitting me, under circumstances of mercy, to live to the age of 89 years, and to survive the fiftieth year of independence, adopted by Congress on the 4th of July 1776...". 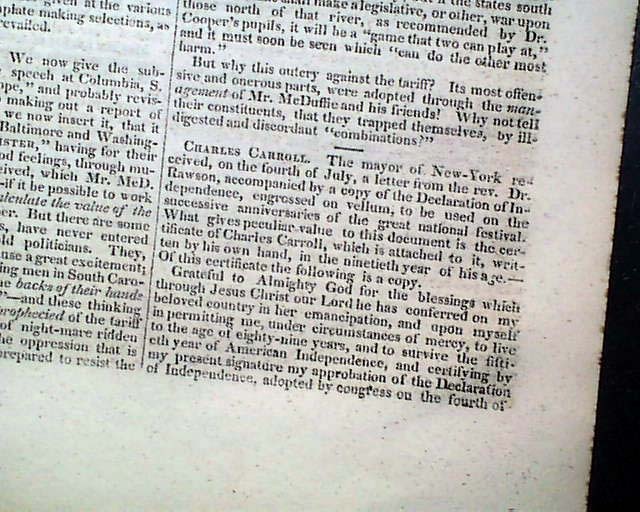 The entire text of his letter is present, and is signed in block type, CHARLES CARROLL, of Carrollton. 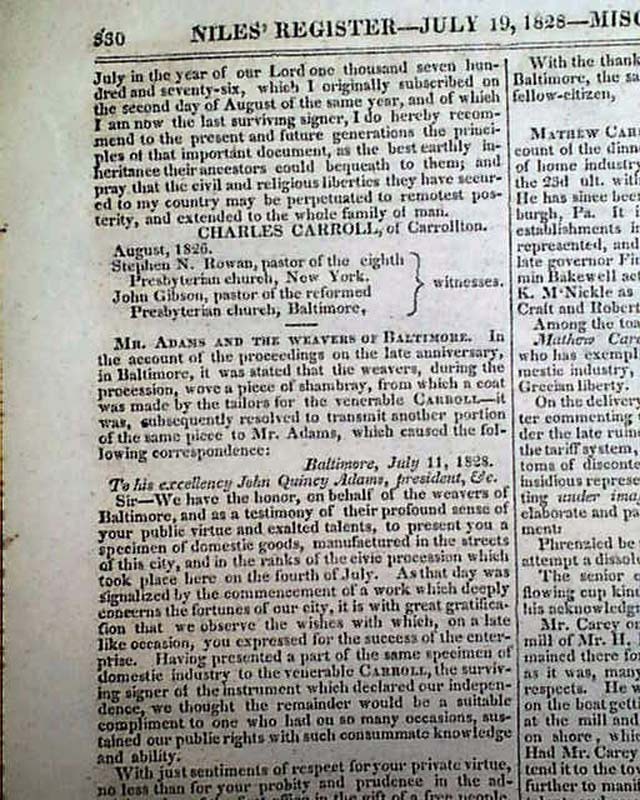 August, 1826. 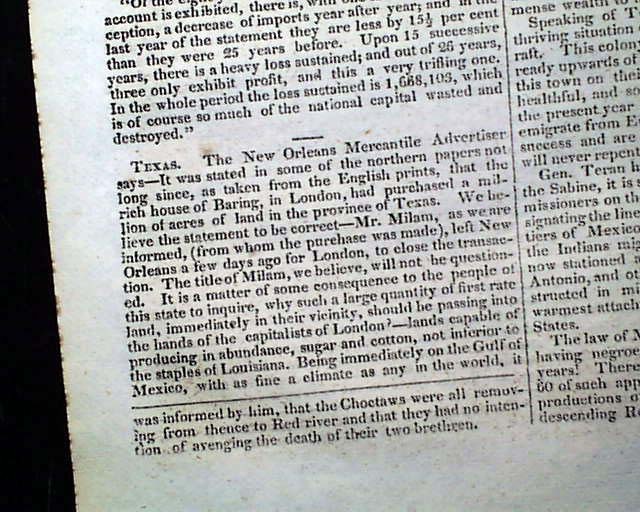 Page 334 has two articles, "TEXAS" and "Natchitoches," which have much concerning early Texas including slavery and the purchase of large amounts of land by London merchants along the Red River border. 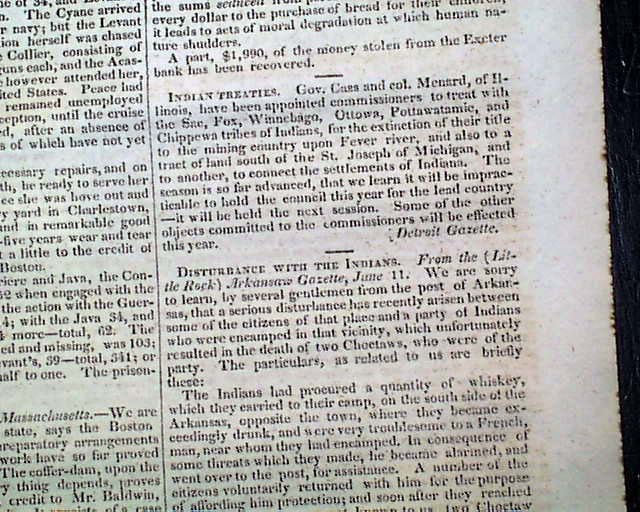 Another pair of articles on page 333 are headed, "DISTURBANCE WITH THE INDIANS" and "INDIAN TREATIES," which have mention of the Choctaw, Chippewa, Winnebago, and Ottowa tribes, among others. 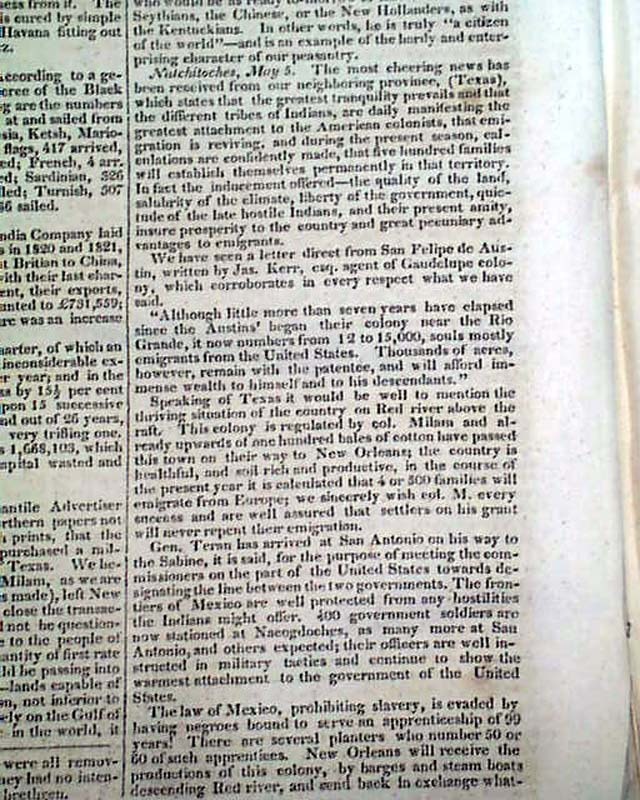 Sixteen pages, 6 1/4 by 9 1/2 inches, only minor foxing, nice condition.